FREE 2-DAY EXPRESS SHIPPING PROMOTION! Through extensive research and development, SafeRest has created a better way to prevent and treat bed bug infestations, while also providing real health benefits for those who suffer from daily allergy and asthma triggers. Of all the encasement brands we’ve reviewed SafeRest are by far the most advanced and highest quality on the market with full protection against bed bugs, fluids, dust mites and allergens. 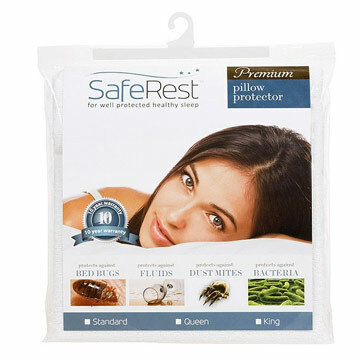 SafeRest was also tested with live bed bugs and are certified bed bug proof. Encasements are important as they seal off the mattress eliminating potential hiding places where bed bugs may reside. They also prevent bed bugs from escaping the encasement leading to their death by starvation. Another great feature offered by SafeRest is their high quality cotton terry surface material back coated with a breathable waterproof membrane layer, which does not sleep hot and makes no noise. Once installed, you can’t even tell that the encasement has been applied. SafeRest Encasements offer two features not available on any other encasement. These features include their patent-pending 360° Secure Zipper feature, which prevents the end zipper traveler from pulling back by securing the zipper traveler with a Velcro flap. The other exclusive feature is their advanced Micro-Zipper, which prevents even the smallest infant bed bugs from passing through. 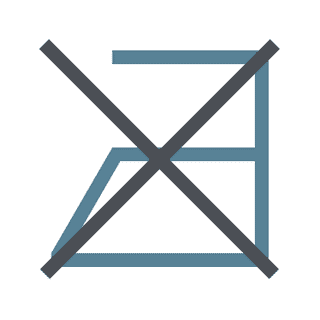 SafeRest encasements are also triple stitched to protect the integrity of the seams. Mattresses today are not cheap and should be protected to ensure years of use. Just one fluid spill or experience can ruin your mattresses, which is why premium encasements should be applied. Those with allergies or asthma will also benefit from the encasements ability to block dust mites and allergens from passing through resulting in improved air quality. 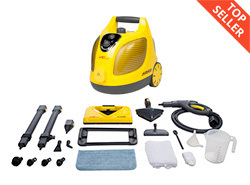 Periodically wash the encasement to remove any dust mites resting on the surface of the encasements. SafeRest encasements are also vinyl and PVC free and offer a 10-year manufacture warranty. Bed bugs earned their name by being more commonly found hiding on or near the bed than anywhere else in infested homes. Bed bugs feed on human blood while their hosts are sleeping, then hide in a tight and secure place to rest, digest, and reproduce. If left unchecked, a small number of bed bugs with access to a nightly meal can multiply into an infestation in just a few weeks. SafeRest mattress encasements and box spring encasements are essential to the process of making your bed bed bug proof. Bed bug encasements seal off the mattress and box spring, eliminating those common hiding places that bed bugs use to breed and to avoid treatment efforts. 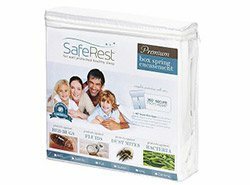 Rather than disposing of expensive mattress sets, SafeRest bed bug proof encasements can be used to seal off the mattress and box spring, trapping any bed bugs inside and preventing them from escaping. Over time, these trapped bed bugs will die of starvation due to the lack of a blood source. When designing their encasements for bed bugs, dust mites, and fluid protection, SafeRest selected only the finest materials and developed their own exclusive features. The result was a breathable, noiseless encasement that prevents bed bugs, bacteria, dust mites, and fluids from passing through. This premium level of protection has helped thousands with allergies and asthma to improve their health by providing a more sterile and allergen free sleep environment. 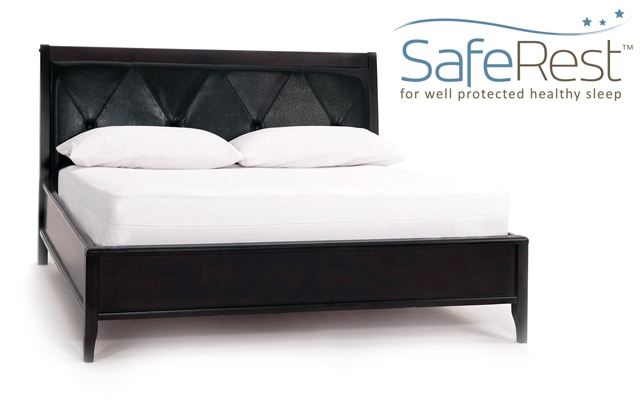 SafeRest encasements have also helped others to protect and treat their mattresses against bed bugs. 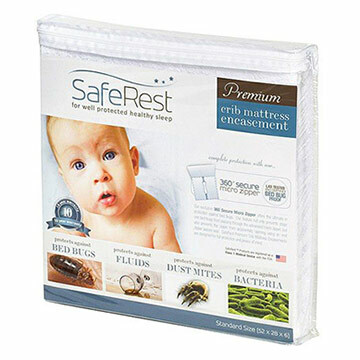 Finally, those who suffer from heavy night sweating or have children, pets, or incontinence have benefitted from SafeRest's breathable waterproof design, which blocks all fluids from passing through. SafeRest's patented zipper and enclosure completely seal your mattress on all six sides. The micro zipper spans three sides of the encasement for easy installation and removal. The micro zipper's teeth that are too small and close together for bed bugs to fit through. 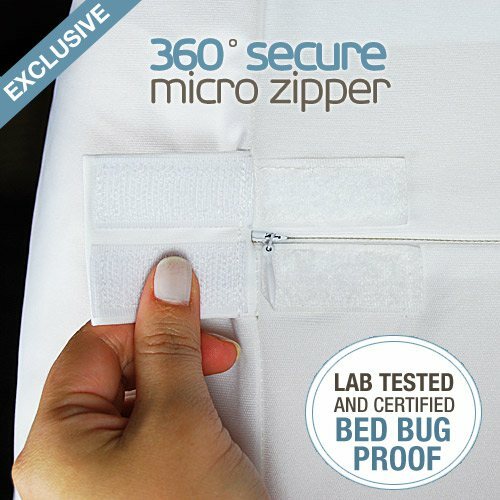 The secure velcro enclosure seals off the end of the zipper to ensure there are no gaps that bed bugs can enter or escape through. 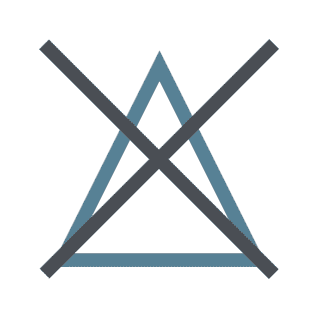 While other encasements use low-cost materials that rustle and retain heat, SafeRest's designers went out of their way to ensure that your sleep experience would be as quiet and comfortable as it would be without a mattress cover. SafeRest Premium's cotton terry surface design is soft, smooth, and noiseless. Cotton terry naturally absorbs water while allowing air and heat to pass through, keeping your bed cool and dry. 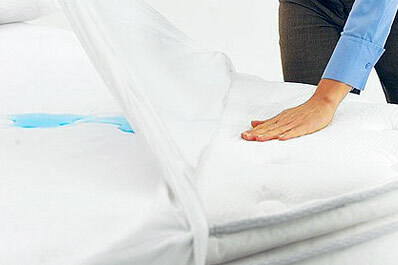 Protect your mattress from fluid spills like sweat and urine with SafeRest's exclusive membrane layer. This unique design blocks any fluids from reaching the mattress while still letting the mattress breathe to prevent heat buildup. SafeRest's waterproof membrane is free of vinyl and PVC. It has no phthalates or fire retardant chemical treatments. It's perfect for children, allergy and asthma sufferers. 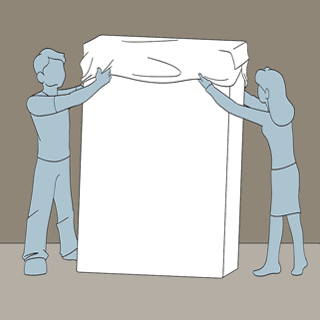 Installing a SafeRest bed bug encasement is very simple, but may require two people since it involves lifting the mattress from the bed. Before you begin the installation, strip the mattress of all bedding, such as sheets and pillows, and remove the encasement from its packaging. 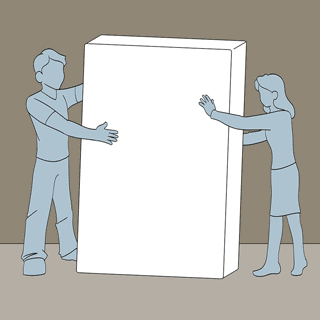 With the help from another person, remove the mattress from the bed frame and lean it upright against the wall. Unzip the mattress encasement on all three sides and wrap the short, unzippered side over the top of the standing mattress. 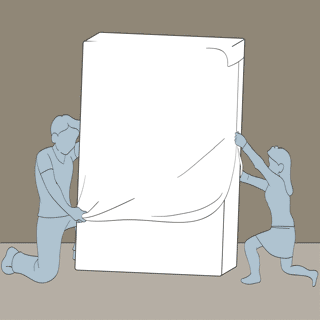 Gently pull the encasement down so that both sides of the mattress are covered, and begin closing the zipper. Set the mattress back down on the bed to finish closing the zipper, and use the velcro enclosure to seal off the end of the zipper. SafeRest's Premium encasements are designed to last for many years if cared for properly. By following the included care instructions, you'll be able to take advantage of all of the protection and health benefits offered by these encasements for the length of their 10-year warranty and beyond. Note that SafeRest's 10-year warranty covers manufacturing and fabric defects, and will not cover damage caused by failing to adhere to the care instructions. 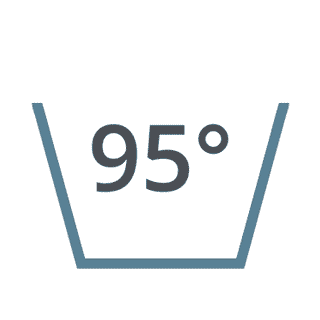 Wash the encasement with the rest of your bedding at 95° Celsius (200° Fahrenheit), usually reached by the medium or high heat setting of your washing machine. Tumble dry the encasement only on low heat to avoid damaging it. Temperatures over 55° Celsius (130° Fahrenheit) can melt or warp the waterproof membrane layer. Do not iron or dry clean the encasement. The high temperatures involved will melt the waterproof membrane layer, causing the encasement to no longer be waterproof. Do not use bleach or fabric softener when laundering the encasement. Bleach, detergents containing bleach, and fabric softeners can damage the waterproof membrane layer. Complete your bed proofing with a box spring encasement and pillow encasements, eliminating as many potential hiding places as possible. Give your children the same protection with SafeRest's crib mattress encasements. All of SafeRest's Premium encasements feature the same cotton terry surface, waterproof and breathable membrane layer, and patented 360° Secure design. Your box spring has tons of potential hiding places available to bed bugs. 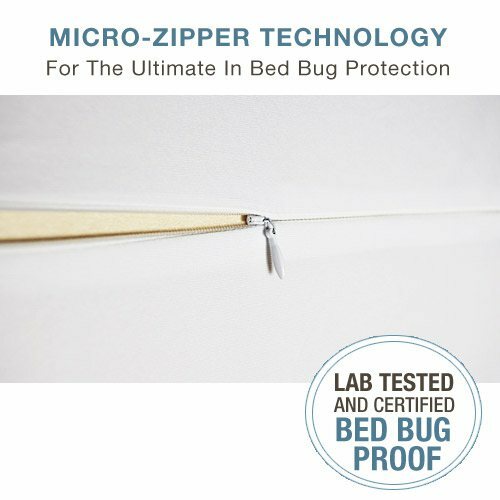 Seal off the wood and seams underneath with the same bed bug proof zippered design that's protecting your mattress. 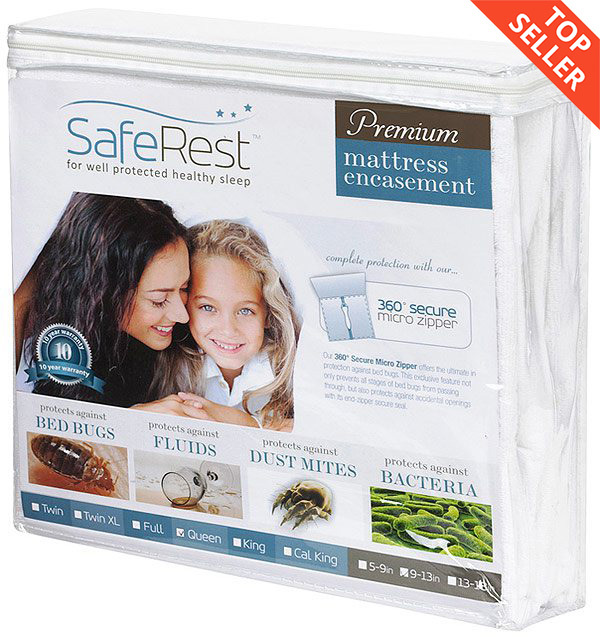 Protect your pillow from bed bugs, dust mites, and bacteria with SafeRest's Premium pillow encasements. They're easy to install, easy to clean, and last longer than your pillow will. Don't let your child fall victim to itchy bed bug bites. 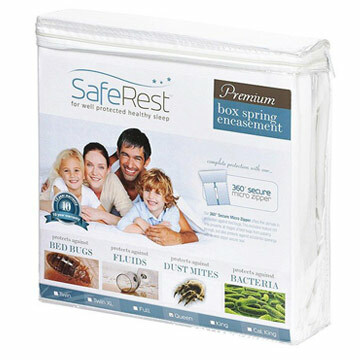 SafeRest's bed bug proof design is also available for standard crib mattresses to protect from bed bugs, bacteria, and fluid spills. Q: how are they laundered? You can machine wash with the rest of your bedding, and a detergent that does not contain bleach. Tumble dry on low heat, as medium or high heat could damage the waterproof layer and ruin the encasement. Q: how far around does the zipper go? 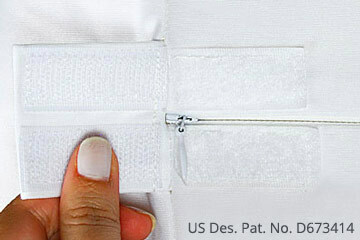 The zipper goes around three sides of the mattress to allow for easy installation. When fully closed, all six sides of the mattress are covered and sealed off. Q: Will this fit a twin mattress 12" deep? Yes, a 9-12" encasement is an excellent fit for a 12" mattress. Q: Where is this product made? Thanks! SafeRest products are made in China, then imported and distributed in the USA. 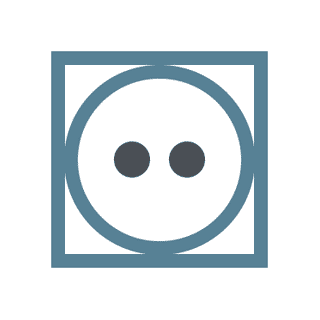 Q: What material are the encasements made of and what kind of zippers do you use? Thanks. Our encasements use a cotton terry sleeping surface with ultra-smooth polyester sides, and SafeRest's patent pending 360° Secure micro-zipper. Q: is it just one per pack? Yes, the price you see is for a single encasement. Q: I have a queen size mattress that is approx. 10.5 inches thick. Will this encasement fit nice and snug or will it be loose fitting ?? The fit on a 10.5 inch tall mattress will be slightly loose, especially around the corners. Excess material can be tucked in between the mattress and box spring to produce a nice snug appearance. However, you'll not notice the material under a fitted sheet either way. 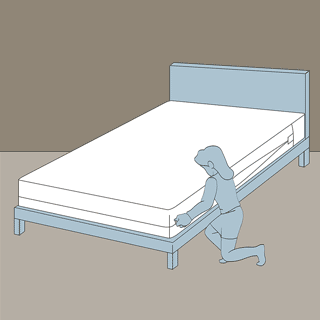 Q: Measuring from the top of the box spring to the top of the mattress is approx. 10". But measuring the mattress from bottom seam to top seam is approx. 9". I would prefer a tighter fit if possible. Which size would you recommend? The 6-9" size can stretch to up to 10". As long as no measurement of the mattress's height exceeds that, it's the best choice for you. We were impressed by the quality of SafeRest. The features are great and it's already protected our bed from a liquid spill. We bought it to protect our mattress from bed bugs and fluids and it's already doing its job. The zippers are unique and it's completely silent. Highly recommend! Reviewed by: Mike from Atlanta, GA. Reviewed by: Daneil from Columbus Ohio. Coming back to buy more! Reviewed by: Linda from NJ. I wanted to say I was very happy to get my encasements in just 2 days. Mike was very helpful over the phone and you could tell he cares about what he does. The box was well packaged. The encasement was easy to put on with just my husband and I and the zippers were very fine with a flap that covered the zipper at the end. It's nice to see good old fashion customer service and a quality product now adays. Reviewed by: Jessica from Atlanta, GA. Went on with ease and the encasement is not hot at all to sleep on, which is why we bought the SafeRest. Also like the 10 year warranty. 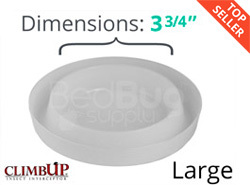 Bed Bug Supply offered excellent customer service and were both courteous and knowledgable. The encasement zipper was as stated and described. Great experience worthy of a great review. Reviewed by: Isabella from Cleveland Ohio. Put the encasements on, the interceptors and used the steamer with powder and I'm bed bug free now. This was a life saver give the price of using a professional. The encasement was really nice with a secure zipper and soft cover. It also arrived quickly, which is a must when dealing with these nasty critters. Good service! Thank You. Reviewed by: Chloe from Kansas City. We purchased one of these encasements to test out as we have 5 beds in our home we need to encase. The encasement came in 2 days and was packaged well. The quality is 100x better than the other one we bought locally, which wouldn't keep anything out. The material is very high quality and the zippers are top notch. We have now purchased them for all of our beds and wouldn't hesitate to recommend SafeRest to anyone looking for the best. Reviewed by: Arnold from California. Very nice product.. It's comfortable.. Very good service and fast shipping..Thanks a lot! Reviewed by: Maricor from IL.. I recently purchased this product and really like the quality. Reviewed by: Brenda White from Louisville. Reviewed by: William from New York nCity.